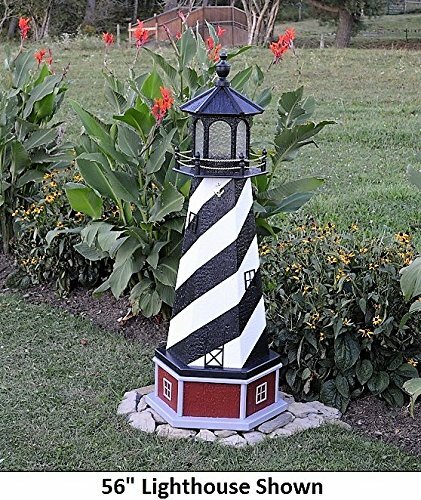 Handcrafted in Pennsylvania by an Amish craftsman, this lighted decorative lighthouse is a great complement to a garden plot or pond! Not only is it a well-built and romantic lawn ornament, but it is a functioning piece of yard lighting, as it includes a 25 watt light bulb with power cord. Hybrid lighthouses have a poly top, wood center, and poly bottom. This is the perfect choice for those who love the striped and painted color schemes available but also prefer the maintenance-free advantages of poly. Since the top and bottom of the lighthouse are the first to be show weathering, the hybrid lighthouse gives a product that will last the test of time. The 5' tall lighthouse itself has an outside bottom diameter of 22", an inside bottom diameter of 16.75", an inside height of 39", an inside diameter of 11.25" at 2' high, and an inside top diameter of 7.625". The base has a height of 10", with outside base diameter of 24", making the overall dimensions of the lighthouse WITH base 70" H x 24" Diameter. Well-built in a sturdy hexagonal shape, this Amish-made replica lighthouse mirrors the iconic profile of its real-life counterpart. Not only is it a beautiful ornament great for use in the lawn or by the pond, but it is a functional piece of yard lighting with its solar-powered LED light. This light can be located far from power sources, as it will charge during the day and shine during the night. LED Light has two settings: solid lighting or a strobing effect, where the LEDs turn on and off in sequence to imitate a revolving motion. Comes with dusk-to-dawn sensor and 4.5" x 3" solar panel. LED plate itself is 3" x 3", attached to an 11" rod. Constructed with LP Smartside engineered wood panels, this lighthouse will resist rotting, splitting, cracking and warping. 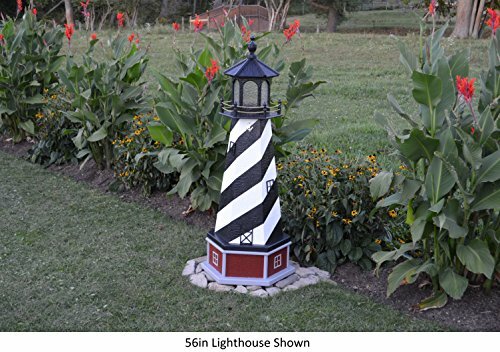 Handcrafted in Pennsylvania by an Amish craftsman, this lighted replica Cape Hatteras lighthouse is a great complement to a garden plot or pond! Not only is it a well-built and romantic lawn ornament, but it is a functioning piece of yard lighting, as it includes a 25 watt light bulb with power cord. The 60" tall lighthouse has an outside diameter of 24" at its base, and weighs 44lb. Make this lovely ornament stand out even more by replacing the standard light with a Backyard Crafts Revolving Beacon Light or a Backyard Crafts Solar-Powered LED Light. This outdoor garden lighthouse radiates beauty that is conveyed only through being Amish handcrafted from natural wood. Each wood lighthouse is constructed from weather-resistant, treated, exterior wood signboard, and finished with a durable exterior paint to ensure many years of radiant beauty in harsh weather conditions. Durability is built into every step of the construction process, exposed wood edges are sealed before construction to prevent wicking of moisture, and marine grade quality stainless steel fasteners are used to prevent rust. Natural woodgrain beauty is accented with a hand painted finish to bring stunning color to your landscape, dock area, or flower garden. Lighthouses come equipped with standard electrical lighting with a 25-watt bulb, and a 8 foot power cord with a plug. This outdoor garden lighthouse radiates beauty that is conveyed only through being Amish handcrafted from natural wood. Each wood lighthouse is constructed from weather-resistant, treated, exterior wood signboard, and finished with a durable exterior paint to ensure many years of radiant beauty in harsh weather conditions. Durability is built into every step of the construction process, exposed wood edges are sealed before construction to prevent wicking of moisture, and marine grade quality stainless steel fasteners are used to prevent rust. Natural woodgrain beauty is accented with a hand painted finish to bring stunning color to your landscape, dock area, or flower garden. Lighthouse comes equipped with standard electrical lighting with a 25-watt bulb, and a 8 foot power cord with a plug. This model includes the base and tower interior lighting package. 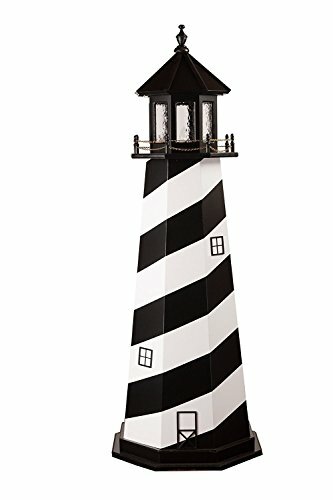 6' Cape Hatteras Lighthouse - Handcrafted by Amish craftsman, these garden lighthouses feature superior construction and romantic charm. Painted with the same style black and white stripes as the famous Cape Hatteras Lighthouse in the Outer Banks of North Carolina. Made of top quality signboard plywood and painted with exterior paint, built to endure all types of weather conditions. Comes equipped with a standard 25 Watt corded light. Measures 69" high x 25" base diameter. Hollow inside cavity measures 48" high x 16.75" base diameter. The inside diameter at 2' is 15.5" and the inside diameter at 4' is 10.75". Cape Hatteras Light is a lighthouse located on Hatteras Island in the Outer Banks in the town of Buxton, North Carolina and is part of the Cape Hatteras National Seashore. The Outer Banks are a group of barrier islands on the North Carolina coast that separate the Atlantic Ocean from the coastal sounds and inlets. Atlantic currents in this area made for excellent travel for ships, except in the area of Diamond Shoals, just offshore at Cape Hatteras. Nearby, the warm Gulf Stream ocean current collides with the colder Labrador Current, creating ideal conditions for powerful ocean storms and sea swells. The large number of ships that ran aground because of these shifting sandbars gave this area the nickname "Graveyard of the Atlantic." It also led Congress to authorize the construction of the Cape Hatteras Light. Its 210-foot height makes it the tallest brick lighthouse structure in the United States and 2nd in the world. Since its base is almost at sea level, it is only the 15th highest light in the United States, the first 14 being built on higher ground. Westman Works celebrated this iconic lighthouse with this wooden replica statue. Decorate your patio and garden with our exclusive wind chimes. 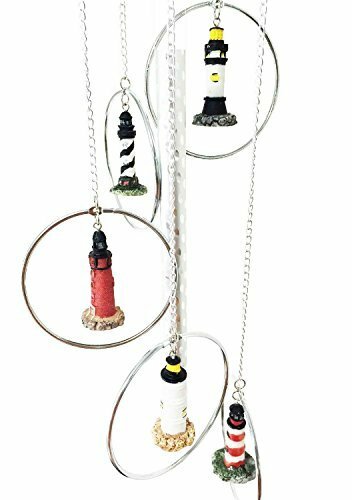 Our wind chimes are not only artistically beautiful as a decor but they also provide calm and relaxation as the rods chime when the breeze comes through.,Decorate your patio and garden with our exclusive wind chimes. Our wind chimes are not only artistically beautiful as a decor but they also provide calm and relaxation as the rods chime when the breeze comes through. Compare prices on Cape Hatteras Lighthouse Base at LiveSaler.com – use promo codes and coupons for best offers and deals. We work hard to get you amazing deals and collect all avail hot offers online and represent it in one place for the customers. Now our visitors can leverage benefits of big brands and heavy discounts available for that day and for famous brands. We try to makes comparison shopping easy with Product Reviews, Merchant Ratings, Deal Alerts & Coupons. Find Deals, Compare Prices, Read Reviews & Save Money.